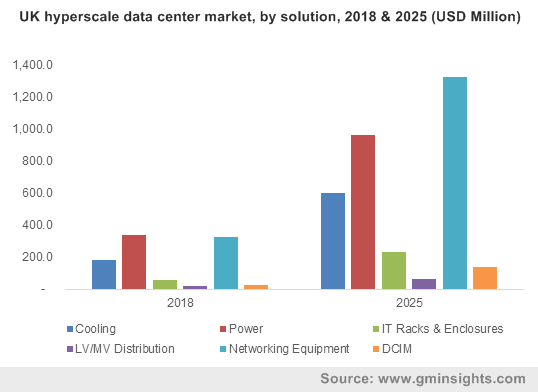 Hyperscale Data Center Market size valued at over USD 20 billion in 2018 and will grow at a CAGR of around 19% from 2019 to 2025. Growing demand for online services such as social networking, live channels, and gaming websites is generating large volume of data that needs to be stored and processed. With the ongoing changes in data storage requirements, growing demand for cloud computing services is being witnessed. Cloud computing offers several advantages such as enhanced application performance, efficiency, scalability, & flexibility and requires high computational power owing to which enterprises are consolidating their data centers to enhance the business profitability. Growing demand for cloud resources and data centers from the consumers and businesses has led to the implementation of large-scale public cloud data centers. These hyperscale cloud operators are anticipated to dominate the cloud industry. Such factors are anticipated to positively impact the hyperscale data center market over the forecast timespan. The Nordic region has witnessed a growing number of hyperscale data centers set up by multinational companies. Favorable environmental conditions and presence of abundant renewable energy sources is encouraging several players to invest in the region, propelling the hyperscale data center market growth. Mega facilities have energy requirements to facilitate operations and to cool the equipment. Renewable energy sources are being adopted by several players for data center cooling; for example, in July 2017, Apple, Inc. announced the construction of a hyperscale infrastructure facility in Denmark, that will entirely operate on renewable energy sources. The company is planning to invest over USD 900 million on this new IT facility. This will enhance the content delivery and service offerings of the company including the App Store, iTunes Store, Maps iMessage, and Siri in the European region. Similarly, in November 2018, Google announced plans to invest around USD 700 million in a Danish data center and would match the facility’s use of energy from fossil fuels with renewable energy generated through power purchase agreements. In the hyperscale data center market, networking equipment accounted for around 30% of the industry share and is witnessing a high demand due to the rapid increase in size of IT facilities to support the widespread business operations. Integration of a large number of servers and storage devices requires effective network infrastructure to ensure the devices can communicate and share enterprise data effectively. Large enterprises are shifting towards software-defined networking to obtain high performance, massive scale and low latency in data transmission and processing. The significant size and capacity of hyperscale data centers presents a network bandwidth challenge to IT organizations, driving SDN implementation. For instance, Google employed SDN principles for developing Jupiter, which is a data center interconnect that supports more than 100,000 servers. Similarly, Facebook and Microsoft have implemented software-based networking techniques to scale up their business operations, providing an impetus to the market growth. The adoption of cloud-based services by companies and the increasing demand for internet-based services is leading to the construction of hyperscale data centers. The growing number of consumers and the resultant demand for social media and other internet-based services has led to a massive amount of data generation. Companies such as Google and Facebook among others are heavily reliant on user information for their business and operations; this trend is further exacerbated by the growth of cloud infrastructure. These factors have necessitated the need for hyperscale data centers. Moreover, there is an increasing demand for colocation services due to the need for affordable and fast data center capacity from the hyperscale cloud and internet providers. The maintenance of dedicated data centers requires extensive specialized knowledge, equipment and resources, which results in increasing capital expenditure in enterprises. Colocation providers offer an affordable and convenient platform for companies to scale and grow their business with minimum complexity at a low cost. Rise in adoption from the BFSI sector is expected to propel the hyperscale data center market growth. Rapid increase in customer base and regulatory efforts for financial inclusion measures is encouraging the businesses to implement large scale IT facilities for data storage. These financial institutions are competing based on the flexibility and easy availability of the services to the clients, that requires faster data mining and processing, thereby propelling the market growth. Integration of large number of servers, storage devices, networking equipment and data management tools offers high scalability & security, low latency and converged networking in business operations. Moreover, the BFSI industry is investing highly in establishing a robust IT infrastructure to scale up their business process. For instance, in December 2016, the US Bank announced its plan to build a USD 250 million IT facility in Chaska. The bank is partnering with Stream Data Centers for constructing this 56,000 square-foot IT facility. Asia Pacific hyperscale data center market is predicted to grow at a CAGR of 24% over the forecast timeline owing to the strong presence of OTT providers and telecom operators. Countries including China, India and Japan have a strong internet penetration rate, thereby providing high growth opportunities to the service providers. Some of the major companies operating in the region include Netflix, Amazon, and Star India (The Walt Disney Company India), among others. These companies are participating in the market by offering their services in competitive prices to attract large customer base. China is the major economy in the region with a large number of mega IT facilities due to the increased penetration of internet users and mobile phone users. In 2017, there were approximately 730 million internet users in the country. Moreover, the telecom operators such as China Telecom, Tencent and China Unicom are engaged in expanding their business operations by constructing large-scale facilities. For instance, in January 2019, Tencent announced that it will build and operate several data centers for the Guangdong branch of China Telecom. 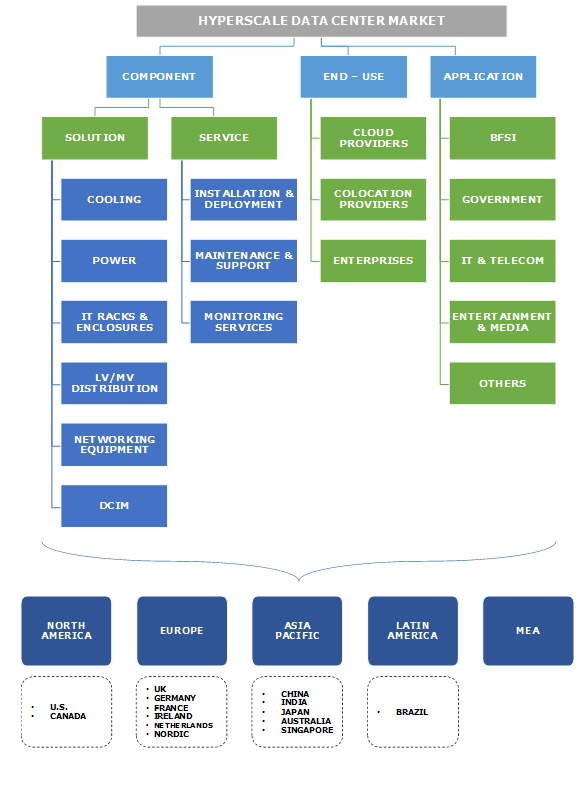 Companies operating in the hyperscale data center market are Schneider Electric SE, Sandisk LLC, NVIDIA Corporation, Microsoft Corporation, Lenovo Group Ltd., Intel Corporation, IBM Corporation, Huawei Technologies Co., Ltd., Dell, Inc., Cisco Systems, Inc., Cavium, Inc., and Broadcom Ltd., among others. The companies are engaged in partnerships and collaborations to develop innovative solutions for mega facilities. For instance, in December 2015, SanDisk Corporation and QCT announced their collaboration to develop and deliver all-flash storage solution that are designed to provide massive resiliency and efficiency to Ceph and OpenStack environment. Players in the market are also partnering with the capital investors for the construction of mega facilities. In February 2019, QTS Data Centers formed a joint venture with Alinda Capital Partners, that will provide USD 1 billion funding for data center construction. The industry players are engaged in developing large facilities that offer mega capacities and colocate a large number of servers to handle large volume of enterprise data. Large scale facilities require advanced storage, networking, power, computing and management technologies. Hyperscale data center market players are targeting this demand of the customers by introducing innovative solutions specifically for hyperscale IT environment. For instance, in March 2018, VIAVI Solutions announced the launch of its testing platform for mega IT facilities. VIAVI MAP-2100, a rack mounted bit error rate tester allows user to remotely test and analyze transmission quality across the network. Similarly, NVIDIA TensorRT offers a high-performance deep learning inference platform that includes the deep learning inference optimizer and runtime which delivers high-throughput and low latency for deep learning inference applications in mega facilities.